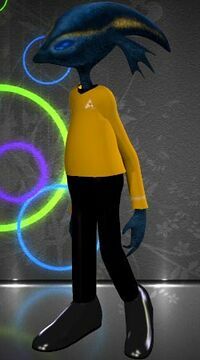 Free resources for Star Trek renders. Note that these should be used for non-commercial works only, unless you happen to be Gene Roddenberry. NOTE: This list does not make use of the list on the DAZ3D forums; it is being compiled independently. Commbadges have their own page. An obj file representing a TOS style-flashlight. An improved (and standalone) version of the other Bruffy chair. TMP era. 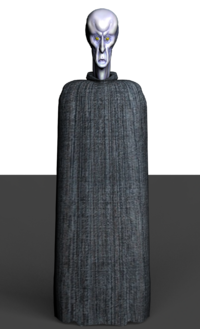 An Obj file representing the alien from "Devil in the Dark"
While thought for the ST II textures for EZ Casual V4 suit, it can be used with others. Here is an old work in progress. Star Trek Motion Picture Bridge. All wall sections have the Y axis centered on the bridge and are modular for repositioning. This is far from complete, but may be a helpfull item for someone who would like to use parts or complete it themselves. Star Trek The Motion Picture bridge chair. This item is rigged as a Poser compatible figure with swiveling armrests as shown in the images. It is also compatible with Daz Studio. A Ferengi Safe with Cardassian Isolinear chips. Wardrobe textures are listed on the Wardrobe page. There might be morphs listed on Famous People that should also be listed here. This page was last edited on 29 November 2018, at 14:57.